Download Hour1 Download Hour2 This week a look at the grim consequences of the logic of imperialist exploitation for profit since the Middle Ages. As a specific example of the general principles we read about in Debt, The First 5000 Years we hear Frank Sanello on the Opium Wars between Britain and China. We start the show this week by finishing reading Chapter 10 of David Graeber's Debt, The First 5000 Years on debt in the Middle Ages. Then for a change of pace we hear a 2009 episode of History Counts in which Frank Sanello speaks on the Opium Wars between the British and the Chinese. The British were very keen on tea, but the Chinese claimed that they could make anything that the British empire could make, so they refused to accept payment in anything other than silver. As a response the British introduced opium into China, and the ensuing Opium Wars revealed how advanced British weaponry was over the antiquated and largely ceremonial Chinese forces. This continues into our second hour. We then return to Debt, The First 5000 Years, starting the chapter on the Age of the Great Capitalist Empires (1450–1971), recounting the what happened when the ruthlessness of the profit motive was combined with European weaponry and technology and organized around large profit seeking corporations. 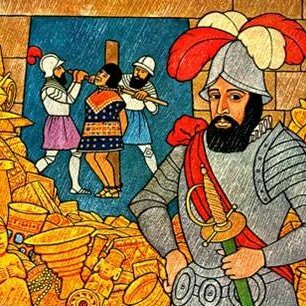 When dealing with conquistadors, we are dealing not just with simple greed, but greed raised to mythic proportions... They never seemed to get enough. Graeber's main focus is the conquistadors of the Spanish empire. He skillfully juxtaposes historical details with thought-provoking and persuasive reflections on the role played by debt and the nature of the money system in shaping the grizzly goings on in the age of capitalist empires. This page was last modified on 20 June 2013, at 07:22.